Condition note: There is no problem in operation. 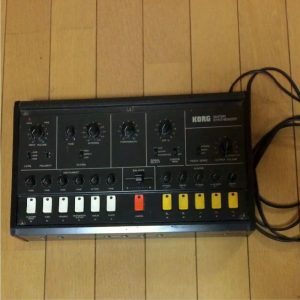 “It is a so-called guitar synthesizer. 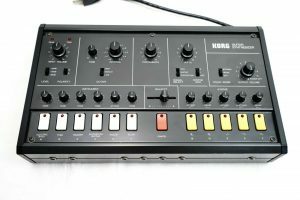 Roland is generally famous for guitar and synthesizer, but KORG also announced a compact model with less malfunction. Not limited to guitar, any instrument can be used as a source as long as it is a musical instrument that produces sound with a single note. You can mix several kinds of presets, or you can control the harmonic overtones like an organ’s drawbar to obtain a sound that can not be obtained with an effector. Hold and portamento are also possible, envelope is also attached properly It can be said that it is a real synthesizer. 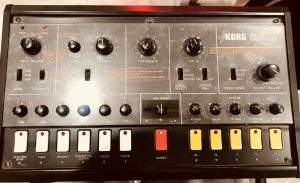 “Up for sale is rare Korg X-911 vintage analog guitar synthesizer. The unit appears to be working reasonably well, I noticed the TUBA sound seems to be only producing small noise somehow, but otherwise all other sounds working and sounding fine as well as all the knobs and switches working as they should. There may be a slight bad contacts on the BALANCE slider, which could probably also do with some servicing/adjustment. All the LED lights above each buttons lighting up correctly when pressed. Cosmetically the unit is in very nice condition as you can see. There are some signs of wear and minor marks here and there, but nothing major. I’m including plenty of photos so you can see exactly how it looks. Comes with the Original Plastic Overlay as shown. Elec Bass LED always on (doesn’t Cancel) No sound either from this preset. Tuba never switches on, so no response from this one either. the other 4 work as intended, including trim pots. LEDs will light & cancel, but none are sounding. I have a feeling this will centre around the filter chip rather than the buttons. Similar to the common fault in the Korg Delta. The parts are still available. The left hand side of the panel is fully working, input, portamento/ interval/ tune/ octave all 100% on the 4 working voices. Still great fun to be had with this alone! Glitchy, Prog-type fun & Octave effects a-plenty! ” This is a vintage synth for guitar that tracks the played note and turns it into a control voltage (CV) to drive it’s internal voices or an external oscillator by way of the patchbay. You can blend the voice side with the synth side simultaneously with a direct output and an external synth if you want to get crazy. There are some controls for foot pedals that I have never used but I recall when I picked it up from Analogman back in the day Mike had fully checked it. That was 17 years ago and I have taken very good care of it. 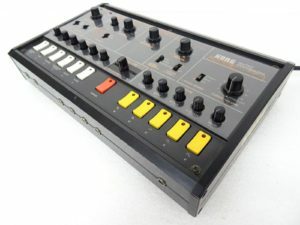 This is a monophonic synth! That is one note at a time, tho it can be fun to play chords for the unpredictable sounds that come out of it. This unit was overhauled by professional technician. 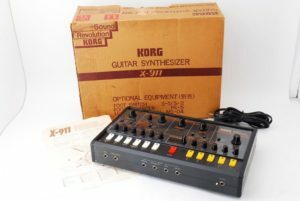 ” Here is a beautiful Korg X-911 Guitar Synthesizer. Unit is fully working 100%. Sounds incredible, only selling because I have two. “Odds are you’re like me and searched for this unit specifically and have been hoping to get your hands on one. 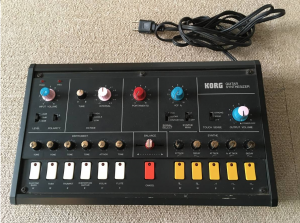 Or you just got lucky and stumbled onto this listing—either way, this is a really cool instrument!! 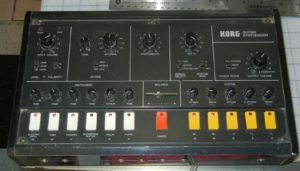 The Korg X-911 Monophonic Guitar Synthesizer (early ’80 or ’81). I rarely fall in love with gear anymore, but as soon as I saw this, I had to have it (and it wasn’t easy to find). Sadly, I have bills to pay, so I have to sell it, though I hope to own it again some day, it’s that cool and unique! 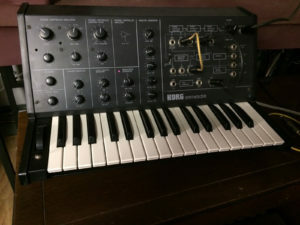 “Up for bids is a mostly functional vintage Korg X-911 analog synthesizer. The VCF, all 6 of the “instrument” patches, all 5 of the “synthe” patches as well as their individual control knobs work great. The CV / Trigger inputs/outputs and both the FM and VCF inputs work as well. What seems to be off is the internal tracking of the VCO. It will not stay in tune past an octave when being externally controlled via CV. This may be an easy fix, but I have already put money into this little guy and need to scale back. Also not working properly is the balance slider between the synthe and instrument sections. “Excellent in ‘almost new out of the box’ condition. A few minor blemishes. No rust or signs of wear. Super clean! Included is Tom stand mount, original box, manuals and overlays. 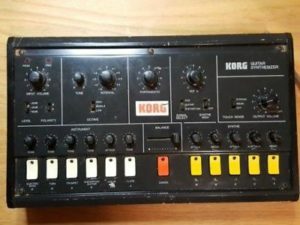 “In good working condition, only slight issue is the ‘synth’ section is always in the mix of the cross fader, (even when over to the far left), not 100 percent sure if this is actually a fault or not, as this one is the only one I have come across and all of the demos I have watched online, never show the crossfader going from one side to the other, usually it’s just left in the center! In good cosmetic condition but does have some marks and scratches here and there. In good working condition, only slight issue is the ‘synth’ section is always in the mix of the cross fader, (even when over to the far left), not 100 percent sure if this is actually a fault or not, as this one is the only one I have come across and all of the demos I have watched online, never show the crossfader going from one side to the other, usually it’s just left in the center! 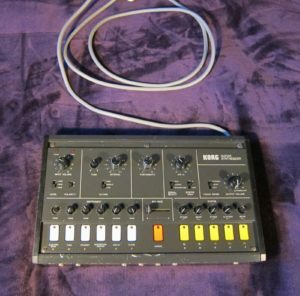 “This is a Korg X911 Guitar Synthesizer Instrument Pedal Effect Synth X-911 up for auction! The unit turns on, all the INSTRUMENT effects on the left appear to be working fine as I tested, however I couldn’t get any sound from the SYNTHE effects on the right. All the LED lights on each buttons are lighting up fine though. There are a bit of scratch noise on some of the knobs, but otherwise the switches and knobs appear to be working fine. Because of the SYNTHE section not responding, I’m selling this AS IS for you to be used with some servicing done. Cosmetically the unit is in reasonable condition for its age as you can see. There are some signs of wear and scuff marks here and there, but all the parts seem to be there in place. I’m including plenty of photos so you can see exactly how it looks. Comes with the original plastic overlay as pictured. “Unit does not work, good project or parts unit. unmolested and all chips are there. Broken circuit board and assorted pots, no returns and ship to continental US only.